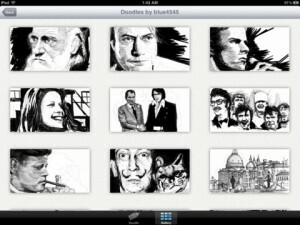 Doodle.ly is a funny app that allows you to doodle on your iPad. From regular pencils to markers, there are 5 different doodling instruments that you can use, plus an eraser. Each one of these instruments comes with its own color panel, so that you know which one to use, depending on what you're trying to create. Just let your imagination carry you away, and see what masterpiece you can doodle. Whether you're thinking of making a sketch or painting a landscape, Doodle.ly has the right instrument for you. Also, once you pick a certain colored marker, brush or pencil, it will be added to your board, along with the rest of the instruments that you already used. This way, you only have to access the main menu when you need a new color or doodling instrument. Once you start doodling, you can undo or erase what you don't like, or delete the entire doodle, if you feel that it's not what you expected it to be. When you're all done with your doodle, it's time to share it with your friends. 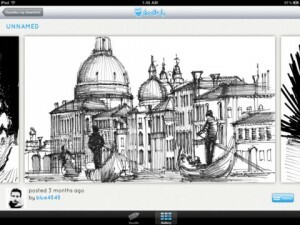 Post it on Facebook or Twitter, and it will also be automatically added to the Doodle.ly Gallery. Here, you can see other people's doodles and, if you really like some of them, you can share them. And this time, besides sharing them on Facebook and Twitter, you can also post them on your Pinboard, Tumblr account, Email or copy them, and even send them to a friend via SMS. And so can others do if they really like your doodle. Who knows? Maybe you'll get so many shares that your doodle will become the next big hit on the Internet. All things considered, Doodle.ly is the type of app that offers you a nice platform, with simple and yet effective graphics, where you get to be the creator. 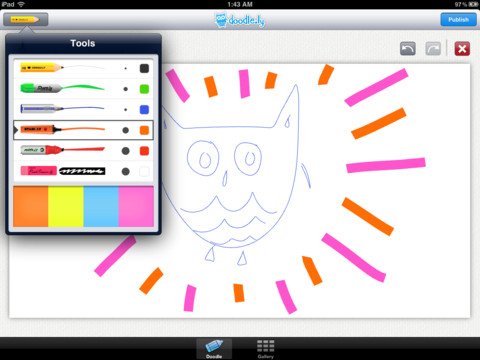 You don't have to be an artist to use Doodle.ly. All you need is a little creativity, some sense of humor, and a message to share. Doodle.ly allows you to speak up and say what's on your mind through doodling. There's nothing special about it. But if you use your imagination, it can be magical. What do you think of Doodle.ly ? Scroll down for our comment section and let us know!